Learn about our fundraising programs at one of 6 locations below. Any person can for any reason. What times and days can I choose from? Any 4 hour time slot on Sundays, Mondays, Wednesdays and Thursdays. How long in advance do I need to book my fundraiser? At least 10 days in advanced however we recommend 3-4 weeks in advanced to give enough time to advertise, allow more people to hear and support your fundraiser. Do I make my own flyers? Can we pass them out in the store? We will provide you with the flyer template! It is best to start passing them out as soon as you get the flyers printed, we ask you not to pass them out to customers in the store. 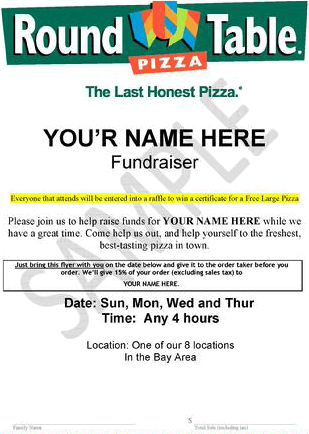 When you book your fundraiser, we will send you a list of ideas of how to circulate your flyers! What percent do we get back and when? You will receive 15% back. We will also honor any coupons you have. We will send you a check of your profit the day after the event. How often can we book a fundraiser? Normally you can book 3 to 4 a year. Depending on the group and/or the reason, more can be accommodated. What other programs does Round Table offer? A LOT!! For Schools, we offer Achievement Awards, Round Table University, and Scrip. For leagues and teams we offer Picture Packages and Sponsorship Programs. For businesses we offer special Business Bonuses! Can we book a banquet room for our fundraiser? When you have a fundraiser scheduled you may not reserve a banquet room.